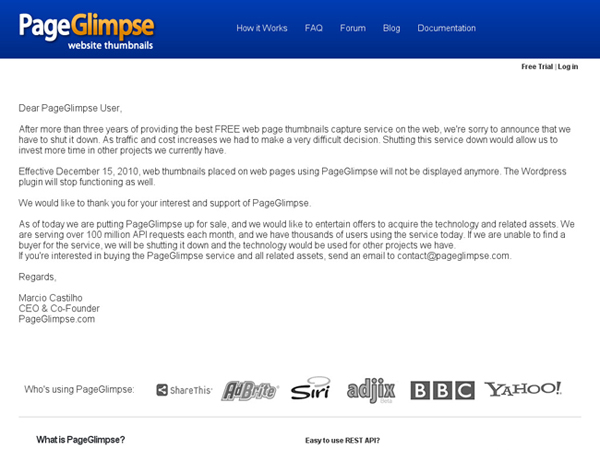 We just learned that PageGlimpse will be shutting down their service as of December 15th, 2010. They cited increasing costs and focus on other projects. This type of service is very expensive to maintain, especially if it becomes popular, so PageGlimpse is having to make the tough decision to leave current customers with a non-working solution, unless they find a buyer. Anyone currently using PageGlimpse is invited to try out ShrinkTheWeb, as our free/basic service supports 98% of our users. However, we also offer premium services and guaranteed response times, for those that require it.